SR: Dr. Brownlee was talking about a couple of things he thinks of as being characteristic of the 'Philadelphia School.' One: big chimneys. The other: what he calls the 'Philadelphia corner.' The latter, I think he may have written about--how various architectural historical approaches 'solve the corner problem.' Is that ringing any bells for you? RV: What does he mean by the corner? Big chimney--actually I think I may have possibly been influenced by Kahn to some extent, but I don't think he ever had a chimney like that. My beach house project, with its big high chimney--never built---horrified Vince Scully. But then also fascinated him at the same time. DSB: You know, the diagonal was very much Philadelphia School. RV: Yes. The diagonal. That's right, that diagonal. 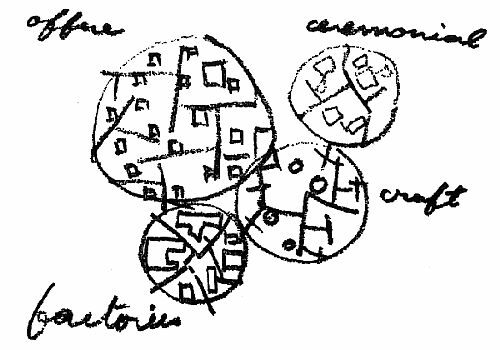 That, I got from Louis Kahn. Alison Smithson, Patterns of association - Each district with a different function, 1953. 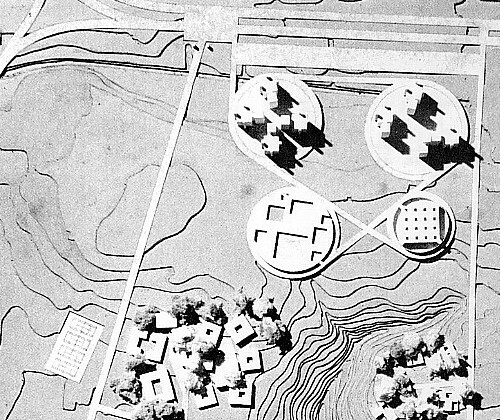 Louis I. Kahn, Salk Institute for Biological Studies, first design phase, 1959-60. 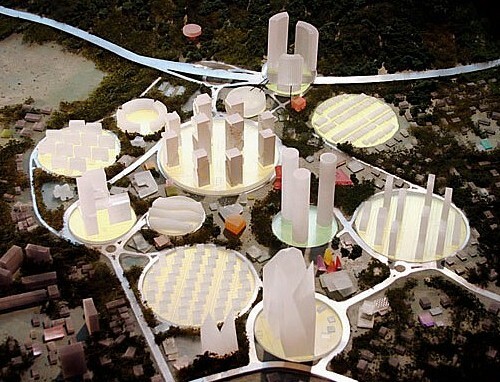 OMA, Penang Tropical City, 2004.